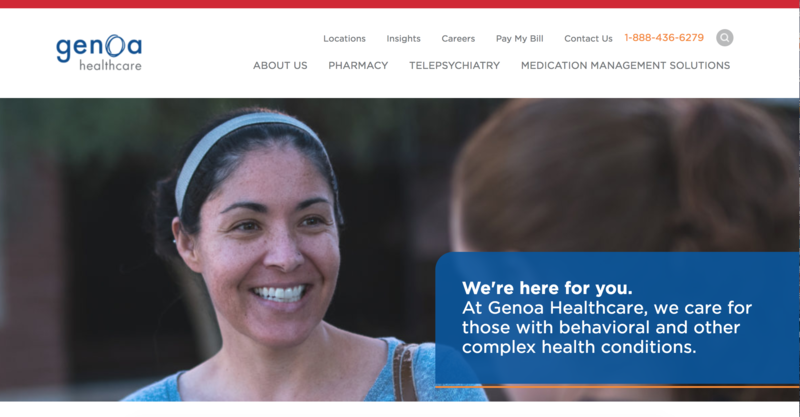 Genoa Healthcare (formerly Genoa QoL) is the largest provider of pharmacy, outpatient telepsychiatry and medication management services. When Genoa first engaged with ArcStone, their website was not representative of the breadth of services they offer and did not serve both internal and external audiences. The website was also using a CMS (Concrete5) that was difficult to manage and update. As you can see, the website had three competing navigations (primary, secondary and audience specific) that created a confusing user experience. Paths to action were unclear throughout the site. The homepage also featured an auto-scrolling slider. Based on industry data, we have seen that sliders / carousels can be ineffective and take up valuable real estate. Aside from general user experience and structural issues that needed to be addressed, the company was also launching a new brand, logo, name and messaging that needed to be incorporated into the new website. A combination of core WordPress, plug-ins and custom development was used for the new website. This provides a much improved admin area for internal website management. We helped Genoa develop detailed audience personas that were used to create a new sitemap, wireframes and paths to action for the website. HubSpot was integrated with WordPress as their marketing automation software. The new brand elements and photography was implemented across the website for a clean look. Appropriate calls to action appear depending on where a user is within the site. Examples include: Download a fact sheet, Schedule a presentation, Schedule a demo, and more. Robust mapping functionality allows users to search and find over 100 Genoa locations. Baseline search engine optimization and 301-redirects ensured that visibility would not be significantly impacted. In fact, organic traffic and overall users are up. And what did the Genoa team have to say? I would say that makes for successful WordPress web design project. The goal moving forward is for the website to become even more of a lead generation and content marketing tool. If you are interested in a WordPress website, please contact our team for consultation and a quote today. Attention current and future WordPress users! We are hosting a WordPress Crash Course on June 20th at ArcStone headquarters. This will be a half day workshop focused on best practices for WordPress hosting, content management, plug-ins and more. Whether you already manage a WordPress site or are considering switching to the platform, this would be a great course for you. Learn more and register below! *If this event has already passed, check out our other upcoming events and crash courses here.